Russia has changed a lot since 007 was feuding with SMERSH in 1963. In fact, it’s not really the same thing at all but in my mind, the whole time I was flying there from JFK, I was thinking of how I thought I would never be able to go to Moscow. But yet, I was going. I was thinking of people standing in line in the snow, but the Cold War is over, Moscow is a big, beautiful city and a lot of fun. Patty J asked me if I would fill you in on my recent visit to Moscow in this blog, so here goes. I couldn’t, but I can now. Elektrozavodskya very quickly became my favorite train station because I liked saying it so much. In fact, I liked the name so much, I just got off the train station one night at that stop and walked around. That’s one of my recommendations in travel, just find an artificial goal and make it happen. You will get to see things you didn’t expect, like this really cool subway station. So, Moscow is this really old city from the 12th century that has been through wars, different government styles, revolutions, you name it. But today, it’s a large (15 – 20 million people) city that’s modern and ancient at the same time. It’s a lot of fun, everyone is friendly, and it’s clean and safe. Why I like the метро (Metro). Ok, I definitely like subways better than busses. I really do. On the subway, you can always predict where it will go, and you can always just get off and go back the other way. In Moscow, you can ride all the trains for about 250 rubles a day (that translates to about five dollars depending on the exchange rate). That’s a great deal and the subway is easy, fast, and they have so many trains that there is often another waiting to pull in when the last one is pulling out of the station. If you want to ride the subway in Moscow (and you do), then get their app for your phone, get Google Maps so you can figure it out quickly, and buy a ticket at the machine the station. Don’t speak Russian? Neither do I. Find the big-ticket machine and push the button marked EN. You can then buy a one-day (or however many days you want) card and ride away. Believe me, the street traffic will make you take the train. There are a lot of really ornate stations and there is even a tour of them so you can check them out. But I can’t see anything on the Metro. Well, that’s true, until you get off the train. Also, Moscow has one of those hop on and hop off bus tour things like you see in Manhattan all the time. There are two lines and you can buy really cheap tickets. Hop on and ride both loops. You get to see a bunch of the city and you can get off and back on, or you can just jump in the subway and ride back to your base whenever you want. Star Trek is here now. In 1967, Star Trek had a Universal Translator so that everyone could talk to everyone else. We used Google Translate and were able to talk to the cabbie and translate his response. You can also use it to read signs and menu items with the camera. You should probably put this on your phone and practice using it a bit before you go. I didn’t need it much except for our ride to the airport, the cab driver (Yandex taxi app) was asking us something and Google Translate told us what it was and then translated our reply. It’s not as good as Star Trek, but it got the point across. Speaking of cabs, you can use Uber or Yandex Taxi. The two merged last year and either will get you where you are going if you really want to ride in a car. We used Uber and YT to get to and from Domodedovo Airport but be sure and allow plenty of time. It took 1.5 hours to get to the hotel and almost 3 hours to get back when we were leaving. The traffic makes Manhattan look pretty tame. Still, trying to negotiate the trains with your bags when you are tired may prove daunting. If you don’t have much in the way of bags, you could give it a shot, but we were being lazy and rode in a car. Ok, ok, but I bet they don’t have any shopping. Well, I was imagining ГУМ (pronounced goom) as this horrible Soviet era warehouse with fluorescent lights, peeling linoleum, and empty shelves while someone plays the violin in the background. I know, wrong era. Maybe that never even existed. I don’t know. It was just an image. Instead, it was basically a super mall filled with high end stores. Think Rodeo Drive or Fifth Ave and you are there. Basically, like Milan, only in Russian. Not what I was expecting. If you want more traditional shopping, you can head over to the Izmailovo Flea Market which has been around for hundreds of years. They sell things on the street and you can buy your souvenirs pretty cheap if you want such things. A trick is to haggle (you have to haggle, c’mon: https://www.youtube.com/watch?v=3n3LL338aGA) by putting numbers on your phone. It works, pretty much, or you can learn to say numbers in Russian but just remember to haggle. The secret to these things is to go around a bit to the shops and see what they are charging for the souvenirs you want, and then head over there. Otherwise, you won’t have any idea what the price of something is like and you will probably get taken in the deal. You will, of course, get taken anyway, but at least you can have an idea of a fair price. Just the starting prices in the flea market were lower than the shops, so I would guess you can get a much better price with a little effort. Wait, are you saying no one speaks English? That’s right, so you have to be nice and learn to say “Спасибо” a lot (spasehba) which means thank you. That’s about all I could say, and it worked out fine. Just smile a lot. Restaurants have menus with English descriptions, and you can always get a guide or someone to show you around (see viator.com). Most hotels will have someone that speaks English as well, so we didn’t have any real problem with it. You can also try my dining trick of just pointing to something someone else has and getting that. I tried it in the Café, and it was a great stew on a cold night. Yummy. No idea what it was but it tasted great. Like I say, you can get menus that have English on them pretty much everywhere. If you really need a fix, they also had McDonalds, KFC, and Burger King all over the place, but I don’t eat there at home so, I took a hard pass on them in Moscow. C’mon, there were restaurants in Moscow in the dark ages, so they definitely have plenty of them now. The word for restaurant is ресторан and Café is кафе, so just look for the signs and you can find them. Co-Host Russ wanted to eat at the Metropole Hotel and Café Pushkin, so we went and found those and, in the process, also found a restaurant called The Sixty (on the 62nd floor) that had all high end type meals. Very nice and compared to New York, very cheap. We paid about 150$ for drinks and dinner for two people (which with us is a lot of drinks and a lot of dinner). I went and ate in the diners a couple of times as well and got out for 15-20$. All delicious. Russians have a wide variety of cuisine from Beef to Borscht (beet stew, which is a LOT better than it sounds). I also love щи (pronounced she) which is a kind of cabbage, sauerkraut, or other green type thing in a soup. Again, it doesn’t sound that great but try it. It’s really good. It’s spelled shchi in the States on menus. I didn’t see any Starbucks, but any café will have coffee and tea. All the coffee is European style so if you want black coffee just say “Americano” and they will set you up. We wanted to go to the Bolshoi (big) theater and see something, so we bought tickets for the only thing that night, Псковитянка. I don't know how to say it, but it means “The Maid of Pskov” which is an opera by Rimsky-Korsakov that topped the charts in the 19th century. The Bolshoi is a very ornate theater and the opera was great. Full orchestra, full choir, you know, an opera. They also have ballet and a website where you can maybe plan a little better if you want to see something specific. We just took a chance and had a nice time with the sellout crowd (and yes, they had subtitles). If opera isn’t your thing, just walk around and enjoy the scenery. Red Square, the Kremlin, all very ornate and you can get tours or not. Viator (viator.com) is a very useful app to have wherever you go, and you can book on your phone. We used that to get a walking tour of the Kremlin and a night walking tour called “Communist Russia” which took us around to a few sights we wanted to see. I wanted to take the tour of metro stations, but since we kind of did that by getting around in general, I never quite got around to it. C’mon Doug, is this place dangerous? Well, I am sure that somewhere in Moscow there are some unsavory districts. I didn’t see them, but I didn’t go looking for opium dens either. I got off the subway at several random stops just to walk around and never saw anything that even seemed remotely iffy. Are there people walking alone? Babies? Burning cars? People selling strange meats out of their coats? Well, you can usually tell if you shouldn’t be somewhere but in Moscow, I didn’t see any negative signs, so I just kept walking around. I didn’t hit the clubs or look for drugs, so I can’t really tell you about that sort of thing, but where I was, everything was clean and seemed safe. Lots of people walking alone at night, very comfortable. Do be careful about the traffic since they seemed to use the bigger and heavier has the right of way rule, but drivers did seem to allow you to cross in the cross walks (watch the locals and see what they do and you will probably be ok). What should I have for this trip? Well, definitely your VPN on your phone. You have heard me say this before, if you are using wifi, you need to be on a VPN. I would recommend, Viator, The Russian Metro App, Google Maps, Trip Advisor, Yandex Taxi/Uber, and probably your airline app. Pretty much the same things I would recommend for a trip to Miami Beach. All those are better loaded before you go since there is a bit of a phone issue in some countries. Russia is a bit of a challenge and my data plan didn’t work there, so I had to buy data a gig at a time and didn’t have my usual flexibility with unlimited data I have in Western Europe. 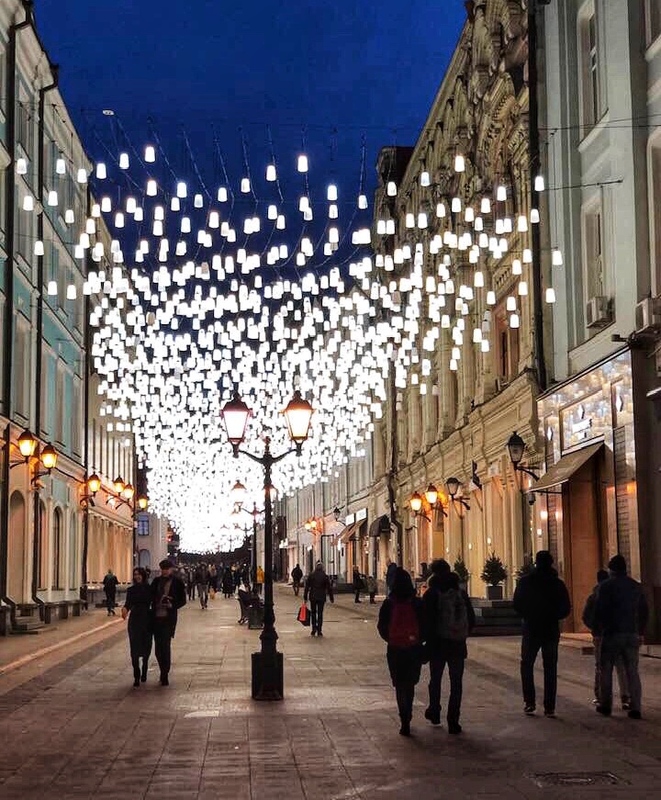 Be sure and check with your provider before you go, so you can decide what you can do and avoid those huge charges you can get for data overages if you don’t have a plan - and don’t assume you have a plan that works in Russia. I would add Google Translate as well and you may want to practice with it a bit. In seven days, we used it about twice. But when we needed it, it was great to have already installed. I didn’t know what to expect from Russia. All my images came from James Bond movies and Cold War propaganda from the 70’s. Moscow is a modern/ancient city that can look like 5th Avenue or Old Europe depending on where you are standing. It was clean, fun, and tasty. How can you go wrong? If you are afraid of the language, just smile a lot and point to something on the menu. You’ll be fine. Doug White is the Chair of Cybersecurity and Networking programs at Roger Williams University. He has worked in the technology industry for many years and specializes in networking, disaster, forensics, and security. He has been paid to break into buildings, talk tech people out of their usernames and passwords, steal money, and figure out horrible scenarios like “What is if a rabid shark swarm was caught up in a tornado while a core meltdown occurred? Could we still watch Netflix?” Doug has a PhD in Computer Information Systems and Quantitative Analysis from the University of Arkansas, is a Certified Computer Examiner, A Cisco Certified Network Administrator, A Certified Information Systems Security Professional, and a licensed private investigator.